plays an often understated but important role as a vital cog of development. As the lead government agency in charge of the development of industrial infrastructure, JTC Corporation (JTC) shapes Singapore’s economic landscape, developing ready- built facilities, business parks, and industrial estates that attract targeted investments, and at the same time, enable industrialists to revolutionise the way they work, live, play, and learn in these estates. 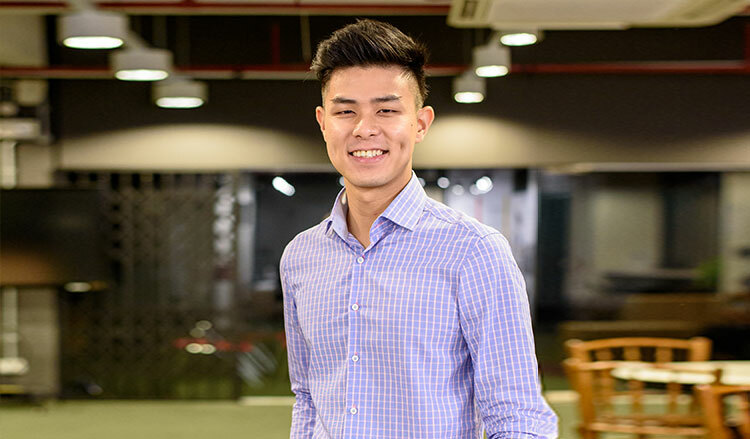 Today, Yang En works as a Cluster Officer in the Startup Department, helping shape the nation's development by aiding the progress of home-grown startups. He explains that this role involves curating the tenant mix within LaunchPad @ one-north – to create a vibrant and nurturing ecosystem of budding entrepreneurs, fast-growing startups, and investors. The diverse startups and enablers in LaunchPad form a community that generates ample opportunities for knowledge sharing and collaboration, which helps accelerate their growth and facilitate success in the marketplace. His role requires him to be constantly plugged into the ecosystem, interacting with startup founders to gain deeper understanding of their work and industry trends. This enables him to shape policies for the future of Singapore’s start-up scene. As JTC takes on the whole value-chain of industrial infrastructure development – including but not limited to master planning, development, project management, marketing and leasing to facilities management – the work is interesting but also challenging. Yang En credits his internships and on-the-job learning for helping him handle his current portfolio. He recalls that his first internship was in JTC’s policy and research department, giving him a better appreciation of policy formation and market research. His second internship was at the department where he is currently working in, broadening his exposure to operations and customer-facing work. He believes the knowledge gained and skills developed have prepared him well in his current role, where he works closely with Government agencies like Ministry of Trade and Industry (MTI) and Enterprise Singapore (ESG) to shape and influence policy decisions. “With JTC’s open culture that welcomes different ideas and approaches, you are bound to be involved in unique ground-breaking projects on a national level," Yang En says, adding that the culture is one that advocates for both the professional and personal development of its officers." Officers are also encouraged to pursue interest-based projects, and will be given the opportunity to rotate between portfolios and work in cross-disciplinary teams to hone their expertise. There are multiple opportunities to specialise in areas like engineering and architecture, and for advancement into leadership roles. Click here to view JTC Scholarships.